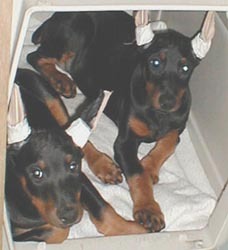 March 18, 2001 - This is Lola (on the left) and her sister, Gretchen, at their breeder's, NuMoon Dobermans, the day we took her home. The tape on their ears is for support; the puppies have healed since the cropping was done and they're not bothered by it. 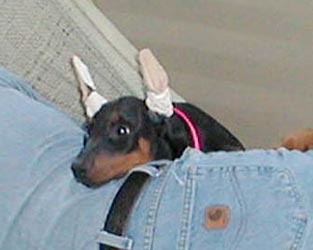 March 19, 2001 - As we hoped, not only do the dogs appear to be fast friends, but the puppy has done a great job of wearing Joxer out every day! 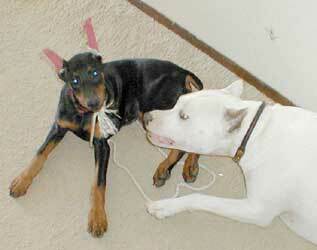 March 19, 2001 - After only one day, Joxer and Lola are spending as much time as they can playing. 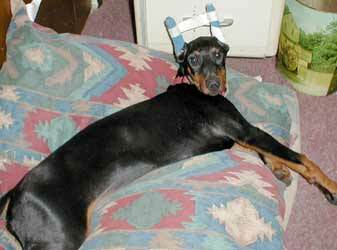 Lola is still in the ear tape, of course, and will be for several weeks yet. 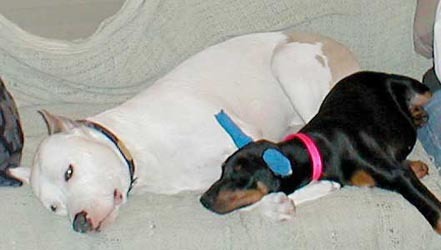 March 19, 2001 - Puppies sleep almost as much as some husbands. Lola actually used the couch and Marty as a security blanket for the first couple days when she was getting used to the pandemonium that is chez Marty and Alicia. 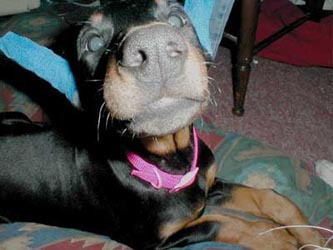 March 20, 2001 - The Doberman honker. 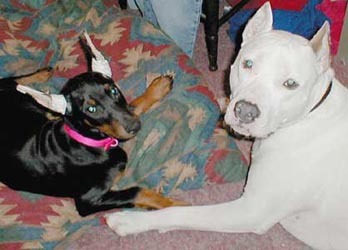 March 29, 2001 - Joxer's brilliant plan to save his cheeks and jaw from Lola's brutal puppy teeth: chain mail! 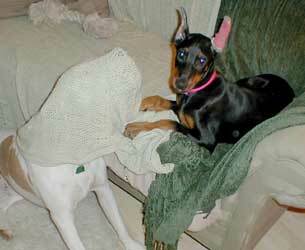 OK, it's actually just a piece of the couch cover he's wrapped around his head, but give the guy a break. She bites him hard and he never complains. 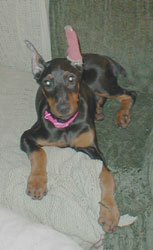 March 29, 2001 - Lola is 12 weeks old here. She's lost one of her ear trees during the rumble, but it's standing pretty nicely, don't ya think? April 1, 2001 - The rope is supposed to be there to help me keep track of her, but she still manages to slip away. April 10, 2001 - Wooby's ears were drooping to the side too much so she got to wear a tree for awhile. What a pain! She's pushin' 16 weeks here, too. Does she look bigger?